If the restart of oil exports from the Kurdish Regional Government area in February served as an indication of an evolving axis of political friendship between the Kurds and Prime Minister Nuri al-Maliki’s State of Law bloc, developments in Iraq during the past month have pointed in the opposite direction. Perhaps the first sign that something was wrong came in August when Kurdish peshmerga troops entered areas in Diyala that they had previously agreed with the central government to stay out of. Whereas similar actions in Kirkuk earlier in late February and March had prompted a surprisingly muted reaction from Maliki (and hence seemed to suggest that the alliance between Maliki and the Kurds could be deepening at a time when Maliki was worried about increasing public anger on Iraq’s streets), this time the Kurdish moves have been followed by a heated verbal exchange between Maliki and Kurdistan’s president, Masud Barzani. Of course, altercations between the Kurds and Maliki are nothing new. They were prominent in the 2006–2009 period as well, when they often focused on the so-called “disputed territories” claimed by the Kurds and the implementation of article 140 of the constitution related to these areas. This time around, however, it is the oil and gas law that has moved to the forefront of the debate. In a recent statement, the Kurds promised to “boycott parliament and government” if the oil and gas law presented to parliament by the government is indeed passed by parliament. The Kurds say they object to new changes to the draft, which include giving the prime minister a somewhat stronger role in the projected oil and gas council, but also involves a slightly different decision-making mechanism on contracts: In the latest version of the bill, contracts signed by regional authorities are invalid unless they are specifically approved by the oil and gas council with a two-thirds majority; conversely, in the old draft, such contracts would automatically be valid unless they were actively struck down by the council, again with a two-thirds majority. In other words, the ability of regional authorities to push through their own contracts is more restricted in the newest draft. Last, but certainly not least, the latest draft indicates a stronger role for the ministry of oil in arranging licensing rounds also in the regional-government areas, which was seen as an exclusive competency of the regional authorities in the previous draft. Constitutionally speaking, then, the latest “Maliki draft” (as it is already referred to by its opponents) is not that much different from the previous version. The creation of the federal oil and gas council recurs in all versions of the draft, albeit with a slightly stronger prime ministerial role in the latest one. True, there are real differences in article 18 second regarding the procedure of approving contracts, but again this is a gradual change from the last version. Perhaps the most dramatic intrusion on what some see as regional rights is the designation of a role for the oil ministry in arranging licensing rounds for the regional entities (article 14), which pro-federal politicians no doubt will see as infringement on the implicit residual right for the regions (and governorates) to sign deals for “future” fields in the constitution (only “existing” fields are specifically mentioned as falling within the exclusive jurisdiction of the central government). Of course, article 112 second of the constitution can be construed as giving the right to the ministry to get involved in all fields one way or another as far as “strategic policy” is concerned, but critics will probably argue that the involvement of the central government both at the contracting stage as well as at the decisive review stage in the oil and gas council means excessive interference. It is unsurprising that the Kurds should react angrily to these changes. Somewhat more unexpected is the latest rush of visitors to Arbil in an apparent demonstration of loyalty to the Kurds in the oil and gas dispute, including Iraqiyya leader Ayad Allawi and the Jordanian prime minister. Iraqiyya, in particular, go quite far in some of their latest comments on the oil and gas law. Yesterday Maysun al-Damluji thundered that the latest draft was not only “unconstitutional” but also gave the oil ministry too much power! Apparently, Iraqiyya have already forgotten the outcry from Iraqi technocrats when the first oil and gas law was presented in 2007 and especially the criticism of the powerful oil and gas council headed by politicians at the expense of the ministry and the technocrats. 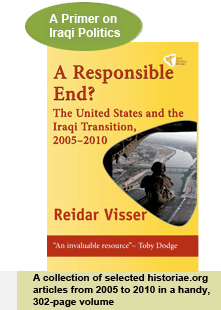 Had Iraqiyya been loyal to its own electorate of past bureaucrats, it would have been more logical to attack the oil and gas council as such (and restore the ministry as the chief power broker) instead of spending so much energy promoting the rights of regional entities. But by exploiting personal animosities between Allawi and Maliki, the Kurds have effectively managed to transform Iraqiyya to a pro-federal party. For their part, Iraqiyya seems to be justifying what they are doing with reference to imaginary mathematics. Supposedly, the goal of it all is to create some kind of opposition alliance aimed at toppling Maliki. Except that the numbers just don’t add up. Even Iraqiyya, the Kurds and minority friends of the Kurds are unable to muster more than around 145 votes, which falls short of the required 163. The Kurds know this and are probably merely exploiting the show of support by Iraqiyya and Jordan to heap pressure on Maliki in order to get a better deal with him bilaterally. Perhaps the best indication of the tactics of the Kurds in this case is their sponsorship of an alternative oil and gas bill which, despite what many press reports say, in fact is not that much different from the government version. Exactly like the Maliki draft, the parliamentary version also provides for a federal commission with veto rights on regional oil contracts, albeit on slightly different terms. But the Kurds know that the parliamentary version is unlikely to go anywhere due to procedural objections by the federal supreme court, and may be co-sponsoring the bill just in order to get Iraqiyya on their side to put pressure on Maliki. It can be argued that if Iraqiyya cannot work with Maliki, they should seriously consider reverting to a more honest, purely opposition role from which they could speak their mind instead of producing convoluted statements of the kind presented by Damluji yesterday. If not, Iraqiyya and indeed the Kurds should be aware of an alternative scenario that is probably on Maliki’s mind every now and then: Building a majority with all of the Shiite Islamists (currently around 158) plus White Iraqiyya (10) and defector elements from Iraqiyya and then pretend to act as Iraqi nationalists and centralists. A sort of Shiite-led version of the old regime perhaps. The more Iraqiyya continues to stultify itself with statements like the recent ones on the oil and gas bill, the greater the probability for defections from within their own ranks. In turn, Maliki’s alternative plan, without the Kurds and Iraqiyya, could gradually become less and less utopian. Maliki may well be hoping that as time passes by, such an alternative will emerge and will eventually allow him to take a more centralist position vis-à-vis the Kurds on disputed territories and not least on the symbolically important city of Kirkuk. The Kirkuk issue is more immediately understood by the Iraqi public than complex legal oil issues and is a question where neither Maliki nor Allawi may be able to give the Kurds all they want. This entry was posted on Wednesday, 14 September 2011 19:18 at 19:18	and is filed under Iraqi constitutional issues, Kirkuk and Disputed Territories, Oil in Iraq. You can follow any responses to this entry through the RSS 2.0 feed. Both comments and pings are currently closed. I noted with interest your comment that the Kurds/Barzani know Allawi’s plan is not gonna go anywhere and that they are siding with Allawi just to pressure Maliki..well, one would think that Maliki knows this as well right?? yet he is truly nervous (even the State Dept told me he is)….so let us examine why he is nervous?? if 163 is indeed too far fetched? … So I gave it some deep thought and I have concluded that Maliki does not want Iraqiya to get close to the 163 because if Iraqiya is 18 seats away then there is a potential for “Kingmaker Status” by ISCI or Ahrar and that could wet their appetite and they may re-think their position…. so the question then becomes whether KIngmaker status with a ton of benefits laid at their feet for joining Iraqiya would be enough to overcome their loyalty and fear of Iran ??? My guess is NNO….Iran’s wishes will prevail especially since -pretty soon- Iraq is ALL that Iran has left in the region. Santana, I suppose Maliki realises he cannot get everything he want. I mean, he put up an unnecessary fight for having Khuzaie as deputy president, he tried to sack the election commission, and has tried preventing the Sadrists from getting too influential in the interior ministry. By now, he probably realises that he won’t be able to keep everyone and every potential problem at an arm’s length forever – if he is going to turn tough on oil/disputed territories and cannot work with Iraqiyya, well that means some concessions to the Sadrists, etc. And clearly he doesn’t like making concessions. maliki is pissed off at the interview Allawi gave to sharq awsat….He declared today that allawi is no longer an acceptable “player” (as if he was before !). So it is personal now (funny). Barham is not going to Baghdad after all. So what’s the hold up? More empty promises from Maliki? Waiting for instructions from Tehran? Iran is releasing hostages (the two hikers) supposedly at the request of Talabani – what is that supposed to be? Strengthening Talabani’s hands while extending an olive branch to the US – lame if you ask me? Santana’ I like your math even better than mine.. ISCI got screwed in the last elections by Iran (the latter helped the sadris in their election strategies on account of ISCI). What is the US doing? Just watching? I wonder. This morning, Iraqi media are devoting some space to the issue of the Jordanian PM going directly to Kurdistan, circumventing Baghdad, which is unusual for this kind of high-level visit. Observer, couldn’t the reaction by Maliki have been expected given that Allawi is on record calling him an Iranian stooge at least once during the past few months and also has called repeatedly for new elections? That isn’t exactly the kind of language you’ll expect from a “partner” in government, is it? it is just a return of the same service to Maliki. Just because Malik does not have the guts to say so publically, he lets his stooges do the dirty work for him. I say it is time for honesty – no? Thanks for your thoughts. Very informative. Any chance that Maliki will make Shahristani retire? Patrik, I think that would be rather suicidal of him, given that he probably has a long-term aim of making the State of Law Alliance stronger. There is already tension within that bloc and Maliki and Shahristani had some internal quarrels in Wasit. If Maliki sacked Shahristani he might potentially lose some 6 deputies or so from the Shahristani faction which would be risky. Once against al-Maliki has antagonised everybody else. I wonder weather the Kurds will be stupid enough to support him again. With Jalal Talabani retiring, a Kurds-Iraqiyya-ISCI alliance could very well form the new government, if Allawis demand is to become President. Kermanshahi, as far as I remember, there were large parts of Iraqiyya that were unacceptable to you, like the blocs of Nujayfi and Mutlak, so that would create troubles with the numbers again. To be honest, I am not sure how far beyond Allawi, Damluji and Observer the pro-federal trend in Iraqiyya extends! Note however that with Turkey chosing to side with Israel against Syria, the Kurds are likely to grow much closer to Iran in the coming years and this could significantly affect the future of Iraq. I could ignore Reidar’s nudges and challenges to debate for a while 🙂 but I can’t ignore your comment: “Turkey cho(o)sing to side with Israel against Syria”. This is fantastic. How do you see this (reality)? I am not a part of Iraqia.. Just a supporter of secularists. I am the first one to tell you that Iraqia is not composed of angles and there are many people in it that I would refuse to break bread with. And the “federal trend” you refer to is better defined as decentralization of services. As for the position of Iraqia on federalism – they have no choice but to abide by the constitution which gives a special status to Kurdistan. They may argue with borders, and that is a legitimate quarrel. Observer, no problem with a special status for Kurdistan, it is on federalism for the rest of Iraq that I think Iraqiyya needs to be clear. Also with respect to the oil sector, as you know, there are different interpretations of the constitution but it is very difficult to argue that the central government should be completely sidelined even in “future” fields since article 112 second on “strategic” energy issues applies to both existing and future fields and clearly does outline a central-government role. وقالت المتحدثة باسم القائمة ميسون الدملوجي في حديث لـ”السومرية نيوز”، إن “مشروع قانون النفط والغاز الذي تقدمت به الحكومة يحصر قضايا رسم السياسات النفطية بيد وزير النفط ورئيس الحكومة”، معتبرة أن “ذلك مخالفا للدستور وللسياسات النفطية”. There is absolutely nothing in the constitution that rules out a lead role for the ministry of oil. Additionally, what she is saying is plain incorrect, since the federal oil and gas council will be the final arbiter both in the government version of the bill and the one prepared in parliament anyway. The differences relate to a chiefly somewhat stronger prime ministerial role inside the commission in the government version of the bill, but these are nuances rather than two entirely different decision-making models. The problem is Da3wa/Maliki attempts to centralize all power in the hand of a few and sideline the parliament. Do not take the oil law issue separately in your analysis while ignoring the rest of the background (the on going struggle between Da3wa/Malik and the rest, or even Iran vs the US vis-a-vis SOFA). On the oil issue, It has been 7 years since Maliki took the mantle. No oil law movement despite meetings upon meetings… Then only when Adnan Janabi forced the issue in July (with the backdrop of all other issues on going simultaneously) did Maliki/Shehrestani present their version while simultaneously claiming that Parliament can not present legislation and only the Prime Minister’s office can (by the way, what is your take on that claim?) The difference between the two versions is not only reducing the power of the PM but also making the role of the parliament stronger. You have to agree that is a healthy thing…. I totally agree that to have this kind of executive dominance in the legislative sphere is unhealthy, but it is hard to do anything about it within the current parameters since Maliki has a supreme court ruling in his favour. More fundamentally, though, the parliament version of the oil and gas bill is almost identical to the govt one. It is such a myth that the two are so different; it is a view held primarily be people who have not compared them paragraph by paragraph! To my mind, the main problem with the bill(s) – and the aspect that Iraqiyya should be concerned about – is the creation of yet another council that takes away power from the technocrats and the professional bureaucracy and gives it to politicians. From the above, it is clear that Damluji is saying: Matters of Policy are in the hands of the oil minister and PM. Your statement “the federal oil and gas council will be the final arbiter” does not challenge the policies which are initially set by the PM. In any case, the question of independence of the oil council is a major concern, which you seem to take for granted. i know that the difference is very little but frankly I have not seen the technocrats of the oil ministry or electricity perform. I know that we are talking about systematic changes, so what I am saying I suppose is that more oversight is better than no oversight regardless of who is in charge of the PM office. Faisal, I’m referring to the law, not to Damluji when I mention the role of the council. I’m surmising that she has not read the law, didn’t understand it, or has forgotten what she read. Take it for what it’s worth- Incase anyone is wondering where Talabani’s group stands on the Brazani oil issue with the dynamic duo – Maliki and Shahristani-?? so I will let it be known that the Talabanis FULLY support what Barzani is trying to achieve on getting a favorably worded Oil agreement draft approved but at the same time they resent (and this is NOT speculation- this is from someone very very high up with the Kurds)Allawis involvement in this…. the Talabanis want to disassociate Allawi from this whole issue and saying to me “it”s a Kurdish VS Central Government Oil rights fight” and we don”t want Allawi in it at all regardless of his friendship with Barzani !….they said that in the end things will be worked out with Maliki to the Kurds favor – simply because he (Maliki) needs them. Furthermore- a message was delivered to Barzani from Talabani that whatever “deal” Barzani makes with Allawi politically must NOT be against Maliki or it WILL be shot down by Talabani and the Talabanis are betting that if a deal starts forming between Allawi and Barzani then at the end Barzani will abide by the Talabani request so as NOT to jeapordize Kurdish Unity. So- as I suspected…Allawi may very well be wasting his time and infact is being used as a tool by the Kurds to pressure Maliki then tossed aside afterwards once Kurdish objectives are reached with SOL and IF for some reason no agreement is reached with SOL -then the Allawi option is still not what the Kurds will follow but they have other reprisals in mind. Today during a press conference, Maliki made a simple point which many seem to have forgotten: Parliament will have two readings of the law at which changes can be done. The law cannot be forced through parliament against the will of the majority. This in turn relates to the rather anti-democratic import of some of the Kurdish commentary on the issue, i.e. “if parliament adopts the law through a majority vote, we will boycott parliament”. The point is, if the law is indeed adopted by parliament despite the many checks and balances in the system – some will say too many – then it can also be described as the outcome of a reasonably democratic process. Santana, Talabani was in on the meetings in Irbil two months ago? He knows fully well that no movement on the oil law would have been possible without adnan janabi’s work in the oil committee. The DC contingent can “resent” all they want, but in the end, the oil law can not be resolved in itself without the other issues being addressed. So are you telling me that Maliki will not only fold on the oil issue and 140 in exchange for Kurds dropping the rest of the Irbil agreement, and backing off on the SOFA extension.. If that happens, then there will be fire works to watch 🙂 . I wonder where the US will go with this outcome? Or Turkey for that matter. I suppose the Turks can apply pressure by taxing the oil transit, but the Iranians can release that pressure…hmm. One thing the Kurds probably don’t like about Jannabi’s moves is his idea to have all contracts approved before parliament! faisalkadri, the Zionists do not want to ever create a Palestian state, therefore they want to create a buffer of puppets around them, that protect them from the rest of the region. Egypt and Jordan’s puppet governments have already endorsed the Zionist occupation of Palestine, now they want to get rid of the last Arab government actively opposing them, that in Syria. By endorsing this Zionist power grab, Erdogan has created a permanent breach between himself and all the Middle East’s independent forces, most notably the government of Iran which has been trying to build alliances in the Levant to challenge the Zionist entity. If Erdogan ruins this for Iran, what do you think they are going to do? They are going to reach out to the Kurds, which are already on bad terms with Turks by default, which will have wider implications for Iraq. Erbil, Sept. 17 (AKnews) – Kurdistan Region’s President Massoud Barzani is expected to send an official open letter to Iraqi Prime Minister Nuri al-Maliki today to repeat Kurdish demands in return for a guaranteed Kurdsih support of Maliki’s government. Sending the letter comes as tensions between the Kurdish leadership and Baghdad escalated over the past two weeks. Maliki’s government had passed a hydrocarbon law that the Kurdish officials said was contrary to the political agreements signed between the Kurds and Maliki. The letter today is expected to be carried by Rozj Nuri Shaways, deputy prime minister – a Kurd. “As a representative of Kurdistan Region’s President Massouid Barzani, I will carry an official and open letter for Maliki,” Mr Shaways said. Maliki will be asked to what extent he is ready to meet the demands of the Kurds before they decide to extend support for his cabinet. Kurds played kingmaker in the March 2010 parliamentary elections when they lent support to Maliki to head the new cabinet after Sunni-backed leader Ayad Allawi beat Maliki by a small margin of two seats. Kurds then presented a 19-point demands list to Maliki to sign before they could officially support him. Maliki agreed to all the points but one that said the Iraqi government will be deemed illegitimate if the Kurds withdraw from the government. The Kurds also said that was unnecessary. The content of the agreements between the Kurds and Maliki have never been fully disclosed. Recently, the Kurdish leadership and other Iraqi political bloc accused Maliki of straying from political agreements and that he was tending to act unilaterally without consulting other political blocs. “If Maliki showed commitment, then we will start implementing our agreements so that they will be done in a short period,” Mr Shaways said. Fouad Massoum, a member of the Kurdish Blocs Coalition (KBC) in the Iraqi parliament told AKnews that Barzani’s letter represents the official position of the Kurdish leadership and that the status of the relations between Erbil and Baghdad will depend on Maliki’s answer to the letter. It now seems that the Kurds want to implement a solution to the Erbil agreeement fast. Based on the above it is likely that new election is comming. This is in a way waste, the outcome may be even more difficult. What I do not understand is why Maliki has agreed, but do not want to implement the Erbil agreement. He destroy his reputation by himself. Who or what is holding him back to implement the agreement ? I do not see any reason lately for him to postpone the agrement. Haavard, Maliki probably signed up to the Arbil agreement (and the separate agreement with the Kurds) because most of the points are vague or depend on parliamentary action or even popular referendums. So he probably thinks he can get away with much less.